-1- Anne has been clingy since I returned, and now she's got a nasty cold, making her even clingier on top of being overtired and feisty. She's also cutting a back molar, and points to her cheek regularly to proclaim: 'ANNE NO LIKE THIS!" As you can imagine, this has been fun for the entire family. But poor babe. She really seems to have caught whatever is making the rounds, which likely means that I will fall sick within 7 days and will take 3 times as long to recover as she does. :-\ She's also been waking in the night again as a result. Good times I tell you, good times. -3- There has been another interesting consequence of my trip: I have lost my knitting mojo. You're probably all wondering what knitting mojo is, because you're not weird like me. Knitting mojo is that constant anticipation and impetus that you feel toward your craft. You're excited by it, you're inspired by it, you enjoy it. Well, when I was so busy over the weekend, my mind awhirl with all of the exciting things that I was learning, I didn't knit. By the evenings I was exhausted, so I didn't worry too much. I first noticed that something might be wrong when I didn't want to knit in the airport and on the plane on the way home. That would usually be prime knitting time. Instead, I was on my tablet, tweeting with all my new friends from the conference. :) Then when I got home...I still didn't want to knit. -6- ...and I wonder a lot about writing. I have always loved to write, I wondered at one point whether I would do that for a living. In a sense I do, because I'm a tenured librarian and we are expected to publish as part of our job responsibilities, and I do have this blog. Is there more opportunities out there for me, though? I don't know, but I have a feeling that I should try and find out. -7- And finally, based upon the above, I have decided to unveil a new series on this blog which will debut shortly. :) I'm super excited, and I do need the help of all of you on this. I got in touch with a few of the priests that I met at the CNMC, and they have agreed to be featured on this blog as part of a short series on vocations, talking about their call to the priesthood and interesting tidbits about their ministry. AND SO, please leave me some comments!! I need to send these nice gentlemen some questions for them to answer, and so what do we want to know from them? If you could ask a priest anything about why he became a priest and/or about his life in ministry, what would it be? Leave me a comment, I'm putting together the list to send them next week!! All right everyone, I suppose that's enough prattling on from me for today. 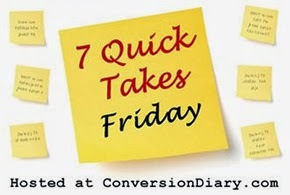 Check out other 7 Quick Takes today over at Conversion Diary! Awesome post, Tiffany! Sorry to hear about your knitting issues, but excited also to see your writing career advance. CNMC was awesome, too! Ryan! So nice to have you here, and thank you very much!! Question for a priest ~ how do you maintain a steady prayer life among all the activities you are asked to do and participate in? Do you schedule time for certain prayers? How do you keep track if you are interrupted during prayer? What is your prayer life like?